Shanghai-based foodie and restaurateur Lindsey Fine (aka Veggie Mama) has been creating all sorts of delicious vegan recipes since moving to China eight years ago. You can read all about the perks of eating a plant-based diet via her blog Veggie Mama and sample recipes on this series, Cooking with Veggie Mama. 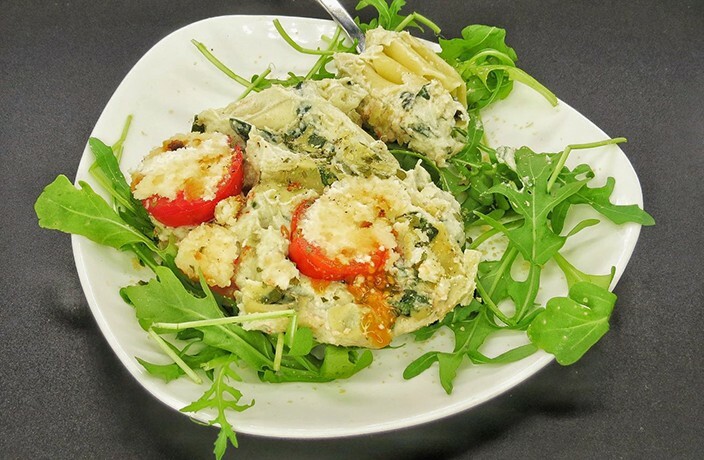 In this edition, Lindsey shares her recipe for Vegan Spinach Artichoke Dip Pasta Bake. Every so often I get a craving for comfort food. Over the holiday I wanted something creamy, delicious and warm. I really wanted to try and use up as many ingredients I had around the house as possible, but I also wanted to try and lighten it up with veggies, so I used cauliflower and canned artichoke hearts. The result was a creamy spinach artichoke sauce that works well as a pasta bake sauce or a dip that’s perfect for parties. It ended up being just as delicious, filling and comforting as I’d hoped! This recipe makes two casserole dishes worth, so one can easily be frozen for future use. 2. Cut off leaves and large stem from cauliflower, leaving the remainder of cauliflower in large chunks. Steam until tender. 3. In a large pan, heat a bit of cooking oil. Add garlic and onion and sauté over medium-high heat until translucent. Stir frequently to avoid burning. Cook for about 4-5 minutes. 4. In a high-powered blender, add steamed cauliflower, almonds, coconut milk, nutritional yeast, lemon juice and tapioca starch. Blend on high until completely smooth. 5. Add mixture to the pan with the garlic and onions and heat over medium-high heat, stirring frequently. Cook until mixture is quite thick and bubbly. Add salt and pepper to taste. 6. Add the spinach and artichokes to the pan and stir, cooking for an additional 3 minutes. Reduce heat as needed so as not to burn. Add salt and pepper and adjust seasoning if desired. 7. Evenly distribute cooked pasta into casserole dishes and top with creamy spinach and artichoke sauce. 8. Bake at 210 degrees Celsius for 15-20 minutes until slightly browned. Pro tip: I topped one of mine with cherry tomatoes and macadamia ricotta. It was amazing!